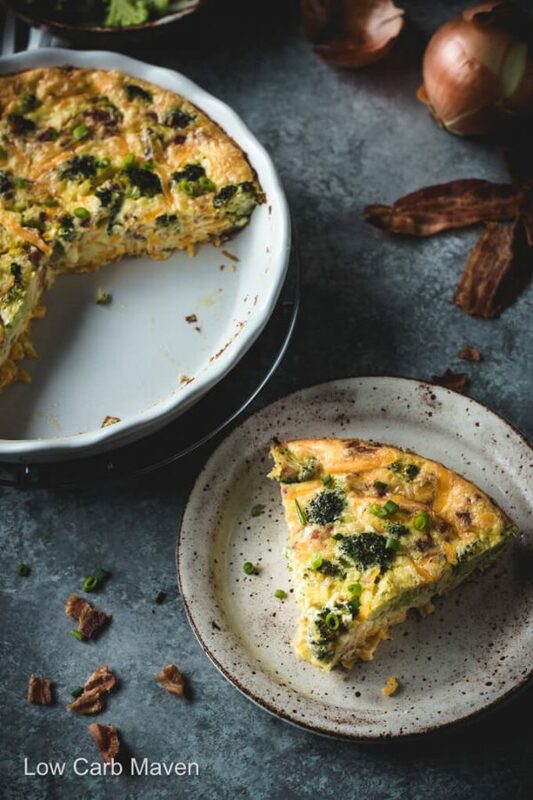 This broccoli cheddar quiche is a tasty crustless quiche made even better with bacon! It’s a great low carb breakfast for keto diets. 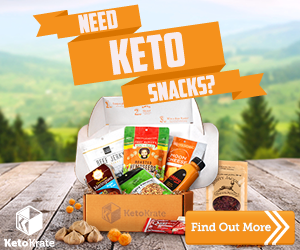 One thing I was happy to add back to the menu after choosing a low carb keto lifestyle was eggs. Eggs are one of nature’s most perfect foods – containing all of the appropriate building blogs to start life. 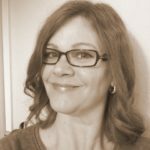 For years, on the advice of doctors and the media, I found ways to eliminate virtually all eggs from my diet. How sad! Make me a good quiche and I’ll be your friend FOREVER! Whether it has a crust or is crustless is not important, I’ll eat it just the same. I’m happy to be enjoying eggs again and all of their nutrition! Broccoli and cheddar is a classic combination. Recipes like broccoli cheddar soup and broccoli cheddar casserole appear on dinner tables every evening. I know my kids gobble-up their broccoli when cheddar cheese or a cheddar cheese sauce is added! Cheddar and broccoli are best buds and I love them together in an easy yummy quiche. 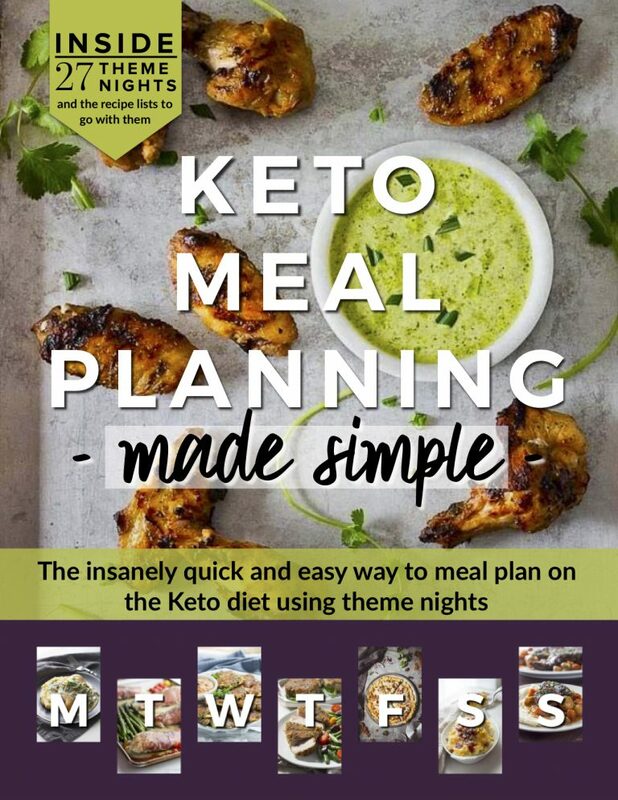 If you are looking for an easy keto breakfast that will feed you all week, then this recipe is for you. Is a Crustless Quiche a quiche or a Frittata? There’s debate whether a crustless quiche is really just a frittata. People usually state that a quiche has a pastry crust while a frittata doesn’t. But, many quiche recipes omit the crust altogether as a way to lower cabs or save time. Although subtle, the main differences between a quiche and a frittata comes down to composition and cooking method. A quiche is often in the ratio of ¼ cup cream (or milk), to 1 egg and 1 ounce of cheese. 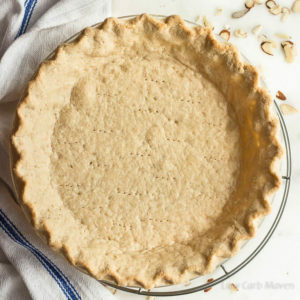 The ingredients are layered into a dish and baked in the oven until browned on top and just set, resulting in a creamy texture. A frittata has little to no added milk or cream. They begin their cooking on the stove and finish in the oven. They often contain cheese and a starch like potatoes. Frittatas are perfect for Paleo or dairy-free diets because they don’t require any dairy at all. Their texture is generally more firm than a quiche, which is creamy. I wanted to make this recipe simply as possible. I used leftover cooked bacon and employed the use of my microwave to lightly steam the broccoli before adding it to the quiche, but leftover broccoli can be used as well. Layering the ingredients is important to ensure even distribution throughout the custard. 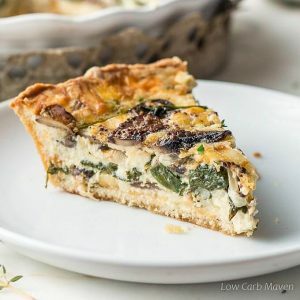 I have many low carb quiche recipes with and without crusts. They are all delicious. Just type the word “quiche” in the search box in the menu bar to see what I offer. 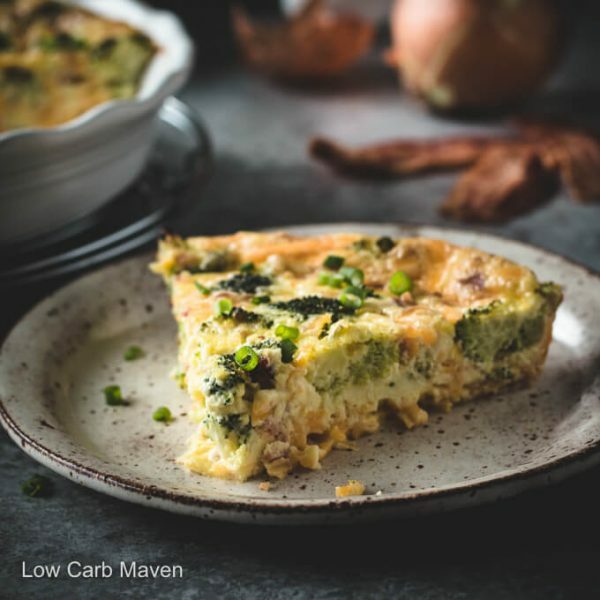 Broccoli Cheddar Quiche is 3.8 net carbs carbs per serving. 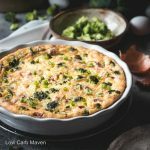 This broccoli cheddar quiche is a tasty crustless quiche made even better with bacon! 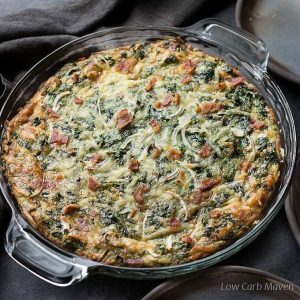 It's a great low carb breakfast for keto diets. Pre-heat oven to 350 degrees F and place oven rack into the middle position. Spray a 9-10 inch quiche plate with baking spry. If you haven't already, cook and crumble the bacon. Cut and steam the broccoli (I use the microwave). Finely dice the onions. 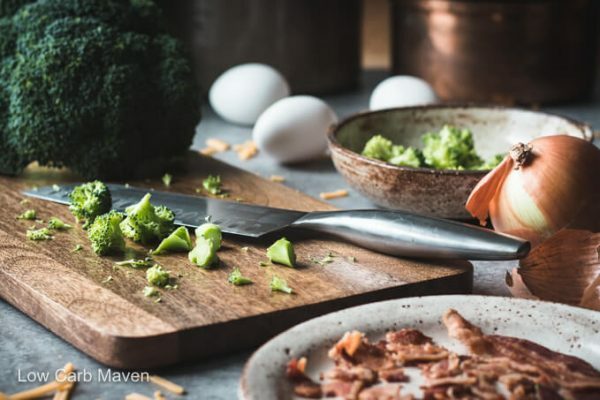 Starting with the cheese, begin layering the quiche ingredients into the quiche plate: 1/4 of the cheese and 1/3 each of the broccoli, onion, and bacon. Continue layering the ingredients, finishing with the cheese. Add the eggs, heavy cream, almond milk (or water), salt and pepper to a medium bowl and beat with a hand mixer until frothy. Gently pour the custard over the layered quiche ingredients. Bake for 30-40 minutes or until the middle of the quiche is just set and the top has browned. Serve at room temperature or warmed. Serves 6. Can I prepare the quiche in the morning and keep in the refrigerator then bake for dinner? Delicious! Had never tried a quiche before, and it was so good that half recipe wasn’t enough for 4 people. Thank you for sharing! So, even though I goofed on the amount of cream, the quiche still turned out and is absolutely delicious. Thank you for the recipe. I am able to get goats’ milk cheese; however, whipping cream is a different story. Do you think I could simply use almond/soy milk? I realize it won’t be as rich, but that doesn’t bother me…THANKS! 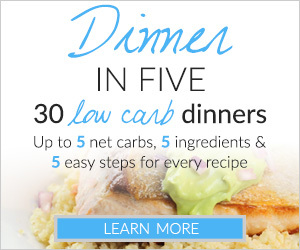 That definitely looks like a yummy recipe and i will be trying it this week, but 8 servings?!? With only 6 eggs in it, i would think it would feed 3 people. Lovely. Could not have been easier. Made a half recipe serving 3-4 and simply did it in my 8 in stainless/ovenproof skillet. I started it as you would a frittata on the stove top with some oil swirled in the hot pan. Added half the egg mixture and swirled that to coat sides and start a “crust”. Then added the broccoli (broccoli rabe in this case) and ham (had no bacon) and the cheese. Used Fontina. Then topped with the remainder of the egg and popped into the oven for 20 min. Worked out perfectly. Creamy, delicious and so easy. Also easy to get out of the slanted sided skillet. Who needs a crust! Great recipe and I so appreciated the “formula” for amount of cream and cheese to egg. And as you said, so flexible …. great way to use up veg or meat leftovers or the last serving of a fresh veg you want to use up. And pick the cheese of your choice. I prefer the creamier cheeses like Fontina or Gruyere but a quiche lets you mix and match to suit yourself. Loved it. You nailed it. This will be my go to quick dinner from now on. I’m so glad you are happy with the recipe, Deborah. I like the creamy cheeses (and SMOKED cheeses), too. They add such a delicious texture and flavor to a quiche. This looks soooo good! I can’t wait to try it. I love your recipes!